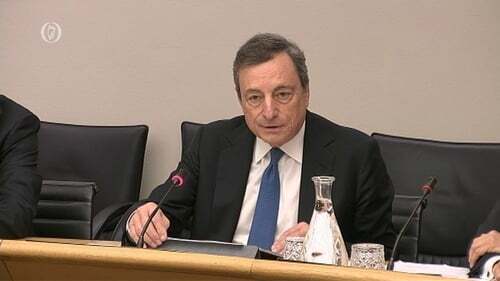 The President of the European Central Bank has said he believes mortgage holders pay higher interest rates here than the euro zone average because the market was not competitive enough. Addressing the Oireachtas Finance Committee, Mario Draghi described the lending market here as being in a 'monopoly or quasi-monopoly situation' and said more action was needed to increase competition. Fianna Fáil Finance spokesman Michael McGrath agreed with Mr Draghi's assessment, pointing out that the average interest rate here is 3.15% compared to a euro zone average rate of 1.77%. However, he said the ECB's monetary policy was not being transmitted to the end consumer in Ireland. Mr McGrath added that the two main lenders here held a very large proportion of the lending market and that new entrants were needed to bring competition to the market. Mr Draghi said the completion of Banking Union should see cross bank lending taking place across countries and that it should enhance competition. The ECB chief also rejected suggestions that the bank presses member state lenders to dispose of non-performing loans in fire sales. He was responding to Sinn Fein's Finance spokesman Pearse Doherty who asked if the ECB was pressuring banks to sell NPLs onto vulture funds. Mr Draghi said the ECB didn't have a preference as to how the banks reduce their problem loan levels. He said they have to examine the details of all proposals, including, as Mr Doherty suggested, a NAMA-type arrangement for the purchase of NPLs from the banks. Mr Doherty said the high level of non-performing loans here was a legacy of the refusal of the ECB to allow the government to burn bondholders, which cost the Irish people dearly. Mr Draghi said he did not want to engage in a reconstruction of the past. He said the ECB had not been entirely negative to Ireland and, given the way the economy is now performing, that its advice hadn't been entirely wrong. The ECB President reiterated his expectation that key interest rates will remain at present levels at least until the summer of 2019. Mr Draghi told the Committee that the ECB was still on course to end its net asset purchase programme, known as Quantitative Easing, by the end of this year. The ECB's key lending rate remains at a record low of zero percent while the overnight deposit rate stands at -0.4% meaning banks effectively pay the ECB to keep money on deposit. Mr Draghi also said that it was essential to prepare for all possible Brexit outcomes, including a no deal Brexit. He said he believed the most likely outcome was a soft Brexit where there is a gradual transition that will allow all parties to negotiate the best possible way for their citizens. Mr Draghi said the ECB will stand behind Ireland and back the country as Brexit takes effect. "The impact on the Irish economy is both direct through trade and indirect through financial channels," he said. "We also see limited overall risks to the euro area financial stability. Without sufficient mitigating action, however, a cliff-edge Brexit could have an adverse impact in certain areas of centrally cleared derivatives markets," he told the committee today.